[Sir Andrew Halliday, personal physician to William IV.] Autograph Letter Signed ('Andrew Halliday') to the 'Assignees of Mr George Underwood', regarding the return of works which are his 'individual property'. Hampton Court; 31 August 1831. 1p, 8vo. In fair condition, lightly aged, with a few small holes, and thin strip of paper from mount adhering to the blank reverse. Reads: 'The Assignees of Mr George Underwood will please deliver up to Messrs Renshaw & Reid all the Copies of my “State of Lunatic Asylums” also all copies of my “Letter to Lord Robert Seymour” as also Any Copies of “Letters from Germany & Holland” or any other of my works that may remain or be found among the stock of the said George Underwood as the whole are my individual Property - | Andrew Halliday | Hampton Court | 31 August 1831'. In Latin except some footnotes. Disbound, from volume of other medical pamphlets, [ii].43pp., 8vo, good condition. M'Kinnal became a ship's surgeon, and contributed to Boyle's, "A Practical Medico-Historical Account of the Western Coast of Africa ..." as well as articles, subjects including yellow fever and black vomit. Mansfield Street, [London], 8 Dec. 1807. One page, 12mo, bifolium, docketed with names etc of the sender ("Gen. Sir A. Clarke") and recipient of letter on p., a small part of which is stuck to p., separated from the other docketing. Text clear and complete. A mysterious further note appears above the letter text "Entd. OB[?] 236". He says: The bearer George, one of my Servants, is so much grown that he cannot wear his Blue Livery Coat, and Red Waistcoat. [ The life of a Victorian Naval Cadet and Midshipman. ] Autograph Log Book of George Tate Medd, compiled during service on seven Royal Navy ships: Inflexible, Imaum, Wellesley, Alarm, Victory, Arrogant, Britannia. 11 June 1850 to 13 March 1853. Including service in: England (Plymouth and Spithead), the West Indian Station (Jamaica, Bermuda, Trinidad), Newfoundland, the Mediterranean (Cuba, Gibraltar, Malta). The present item is a remarkably disciplined production for a boy ranging in age from twelve to sixteen. At the beginning of the volume the author writes: 'I, George Tate Medd 4th. 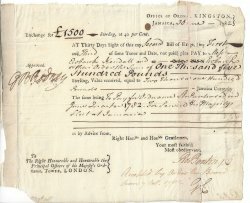 Son of John and Sarah Medd of Stockport, Cheshire (at the age of 12¾ years), entered Her Majesty's Navy as Naval cadet on board H.M. Ship “Impregnable” June 11th. [ A Royal Navy midshipman in the Crimean War. ] Autograph Log Book of George Tate Medd, compiled during wartime service on HMS Rodney and HMS Sidon, and including an eyewitness account of the Battle of Alma. 14 March 1853 to 31 December 1854. Service in the Mediterranean (Malta, Turkey), the Black Sea (the Crimea). [ Sir John Jeremie, Governor of Sierra Leone. ] Autograph Note in the third person, inviting '- Payne Esqr.' to dinner. Sir John Jeremie (1795-1841), British judge and diplomat, Chief Justice of Saint Lucia and Governor of Sierra Leone, whose writings contributed to the abolition of slavery. Government House, Freetown [ Sierra Leone ]. 10 January 1841. [ Sir Frank Stockdale, agriculturist: offprint. ] The Work of the Caribbean Commission. Reprinted from April 1947 issue of International Affairs. Published Quarterly for the Royal Institute of International Affairs, London, by the University of Toronto Press. 8pp., 8vo, paginated 213-220, with separate title page. In fair condition, aged and worn, with rusted staples. Address given at Chatham House on December 17, 1946.' Stockdale explains how 'The Anglo-American Commission was established on March 9, 1942, for the purpose of encouraging and strengthening social and economic co-operation between the United States of America, its territories and bases in the Caribbean and the United Kingdom and the British West Indian Colonies. [...] President Roosevelt [...] was largely instrumental in the formation of the Commission and selected Mr. Charles W.
[Major-General Francis Gilbert Hamley.] 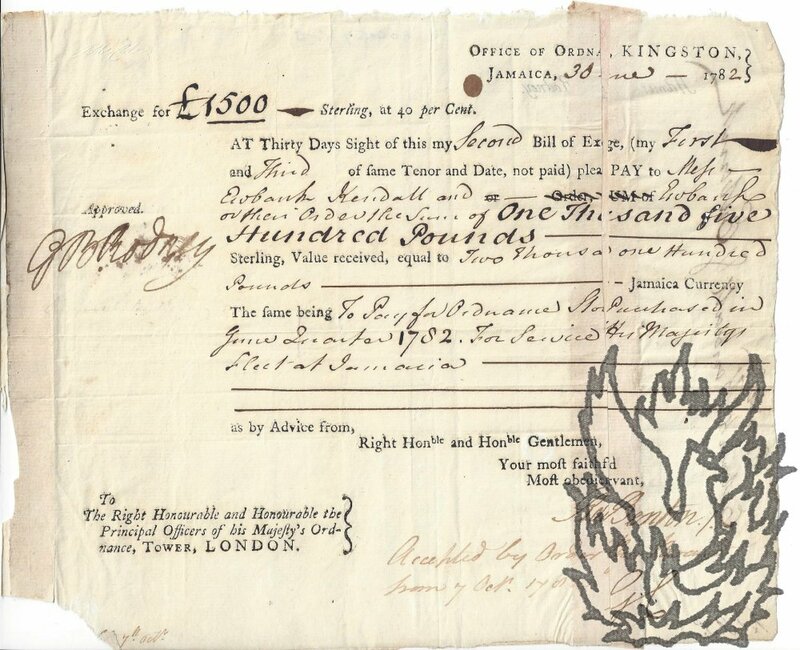 Printed 'Testimonials in support of an application made by Captain Hamley, Army Pay Department, for the appointment of Colonial Secretary, Bermuda. 3pp., 12mo. Bifolium. In fair condition, on lightly-aged paper, with crease at one corner. In small type. Containing six testimonials, dating between 1883 and 1889, from: Lieut-Gen. T. L. Gallwey, Governor & Commander-in-Chief, Bermuda; Lieut-Col. De Pentheny O'Kelley, A.P.D. ; Emma Laffan ('Lady Laffan, widow of the late Sir Robert Laffan, late Governor and Commander-in-Chief, Bermuda'); Lieut-Col. W. F. Kerr ('Commanding "The Buffs," Dover'); R. H. Knox ('the Financial Secretary'); H. W. Just, Private Secretary to the Secretary of State for the Colonies. Note at end: 'MEMO.